The social media brouhaha and exchange of venom leading up to Juliani’s Who Is King concert set an excellent tone for two climaxes, the first being the relative success of the concert itself which ended up giving extra exposure to up and coming talent Kaa La Moto. The second was King Kaka’s surprise release of his latest fifteen track mixtape It’s The King on the very day of the concert. This release gave King Kaka the leverage to make a very strong statement of his own despite his absence from the event, implying that he would prefer to do battle in the studio and through the lens of commercial success. King Kaka’s opener Back In 2007 starts the mixtape off on a nostalgic note. On a We Are The Take sampling beat, the track traces back his roots from the humble WAPI concert rap battle beginnings to what he has become today. 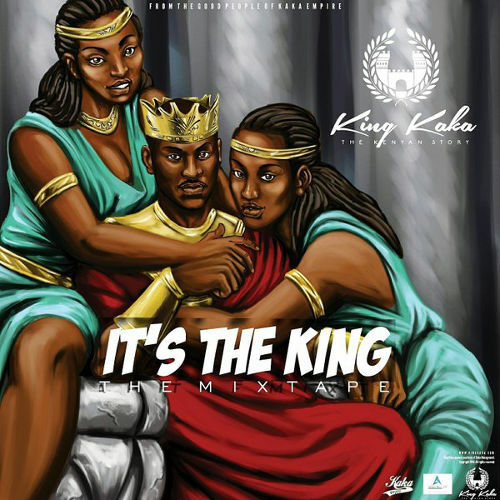 If one is to assume that the theme of It’s The King is King Kaka re-affirming his position at the apex of the Kenyan rap game, the mixtape proper begins somewhere in the middle with a four song lyrical blitzkrieg comprising of Gorilla, Uko Wapi, Ule Msee and 100. He savagely charges through his challengers in Gorilla, complete with a Mohammed Ali clip, at least one metaphor per bar and enough namedrops to make The Game sit up and take notice. After inflicting such damage, King Kaka takes some deserved victory laps on Ule Msee a bouncy reggae-influenced tune and Uko Wapi, an old school hip hop soundtrack to a conversation between himself and a previous version of his alter ego. He bares his fangs again on 100, a braggy body count of the casualties inflicted by Gorilla. These five above-mentioned tracks could have made one hell of a superb, self-contained EP, and probably one of the best this year. That being said, the mixtape comes with 10 extra tracks, mostly comprising of the usual King Kaka fare and a few interesting highlights. It’s not a complete King Kaka record without a bunch of contemplative spoken word style pieces. Here we have Mama featuring up and coming band Third Hand Music, Rail On a tale of love lost with the Papa Wemba classic of the same name forming a perfect basis, and Nisamehe a self-examining confession of imperfection. The extensive number of hands on the production side of things leads to an pleasant diversity in sounds ranging from old school hip hop, afro-fusion, trap, reggae, and even a little dubstep. Ken Ring, Ricco Beats, JR, Sniper, Jack On The Beat and Kanyeria clearly brought the business. Jack On The Beat lays a minimal but decadent beat on Hatutoki, perfectly mimicking the all-too-familiar sensation at the peak an extremely turnt up night out when most elements of songs in the club are drowned out by a glorious bass line. While the guest appearances are just as numerous as the producers, some of them are quickly forgotten. Third Hand and Majero provide the stand-out vocal support while the most notable collaboration is an East African affair featuring Uganda’s Navio and Tanzania’s Jay Moe. It’s The King is probably the best possible response King Kaka can give to the raging #WhoIsKing debate. Bar three or four less engaging tracks, this tape is an enjoyable listen overall, especially at the mid-section. It also provides the personal, contemplative moments that a majority of King Kaka fans have come to expect from his album and mixtape releases.